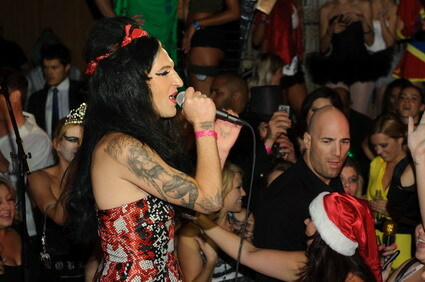 Friday night LAVO Nightclub kicked off Halloween Weekend with a special performance by Mickey Avalon. The rapped appeared dressed as Amy Winehouse and started his show off with a fitting new song, “Going Back to Rehab”. He followed up with his hits “Jane Fonda” and other favorites. Adult film superstar Katie Morgan, who is a huge fan of Avalon, came out to the show and Mickey interview her to join the table where she partied alongside the recording artist and his girlfriend for the rest of the night. Earlier in the day Avalon was spotted soaking up the rays at TAO Beach and he enjoyed a dinner of signature dishes at LAVO before heading up for his performance.